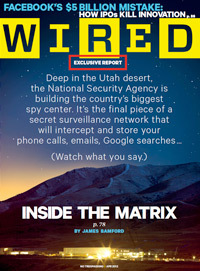 Wired Magazine has published an extensive report detailing the United States' National Security Agency's building of a heavily fortified, $2 Billion facility in the heart of Utah's polygamist-Mormon district. The facility's purpose is to intercept, analyze and store electronic communications of all kind from around the world, housing the information on massive amounts of servers and databases. Please read the Wired article and watch the videos below for more information on this spy complex, straight out of Orwell's 1984. Be sure to share the knowledge.